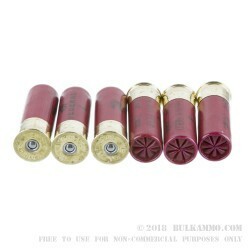 This is a 250 round case lot purchase for the extremely versatile Federal Heavy Field Load of the #4 shot that is suitable for all types of field work, but whose capabilities don’t stop in the field alone. The #4 shot can be a very effective in a home defense scenario without some of the risks of over penetration that certain high-power loads have, like 00 Buck shot or slugs. The 1 ¼ ounce payload offers a very nicely sized pattern at moderate distances and makes this suitable for turkey or other birds, which is the primary target in field use. The potential for use against small game at larger distances or coyote or other predatory animals around a ranch or large property makes this a versatile choice to have on your shooting shelf. 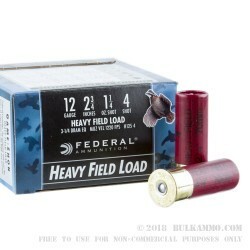 The Federal shotgun loads are proven performers and they are always quite reliable. For this 250 round case, the price point offered is a great value proposition. The high base hulls can be reloaded if you prefer to reload your plastic. 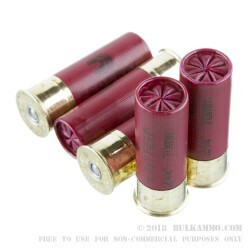 The versatility in mainstream guns and the consistency of the recoil, shot patterning and accuracy means that you won’t be dissatisfied with Federal shotshells regardless of what use you put them to.